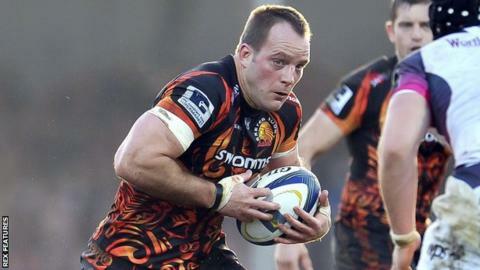 Exeter Chiefs forward Kai Horstmann has agreed a new one-year deal. The 34-year-old back-row joined the Chiefs from Worcester in 2012 and has played 66 times. "Kai has played a really good role for us this season, whether it's starting or coming off the bench," said Exeter head coach Rob Baxter. "We really like what he does off the field - he trains very hard and is diligent, plus he's a good, experienced player who conducts himself well." Horstmann has made just two starts and six replacement appearances in all competitions this season, but despite that Baxter said he was an important member of his side. "First and foremost it has to come down to playing form and Kai has maintained that and his training form," he added. "As long as a player is doing that, then those are good signs for us. Kai is training as hard as ever and he looks as durable and fit as ever. "He has the quality and experience of being in and around professional rugby for a long time and he drives a lot of very good qualities into the squad."